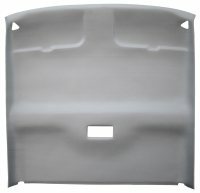 Notes: This Headliner board is made of ABS plastic, and only fits in the 2 Door Extended cab. Because of this item's size, it must be shipped in an oversized box. Please be careful when selecting the color for your Chevrolet Full Size Truck, Extended and Double Cab headliner. We have many color options to choose from, and some shades are very similar. If you are not 100% certain of the correct color, please allow us to send you samples by	clicking here. Stock Interiors is proud to offer the highest quality	Chevy Full Size Truck, Extended and Double Cab Headliner Replacements available. Our Headliner boards are made to fit like the original, but are made of ABS plastic which is much more durable than the original pressed cardboard composite board. The plastic board is either vacuum molded or die cut (flat) to fit the same as your original Chevy Full Size Truck, Extended and Double Cab board. The ABS plastic will not warp or absorb moisture resulting in a headliner that will look as good as your original! Each headliner is covered with material in the color of your choice and has a lifetime guarantee on the plastic and 1 year on the material.